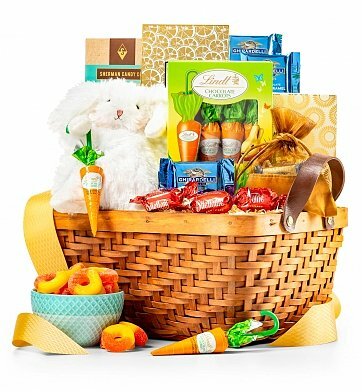 Perfect for kids and adults of all ages, this Easter bunny comes hopping down the trail with a basket full of delicious Easter candy including Ghirardelli squares, gourmet candies and adorable Lindt chocolate hazelnut carrots. Wrapped up with a pretty satin ribbon, this is an Easter offering that won't be forgotten! 6" Plush Easter Bunny from Wee IttyBit. Lindt Chocolate Hazelnut Carrots, Peach Gummies. Ghirardelli Dark Chocolate Sea Salt Caramel Squares. Chocolate Pomegranate Truffles, Cherry Sours and more. Your gift will leave a lasting impression as they repurpose and continue to enjoy this charming woven basket with leather handles. Measures 12" x 9" x 6". Easter Bunny Chocolate Basket is a hand delivered gift. These gifts are delivered by one of our local design centers located throughout the United States and Canada. Same day delivery is available for most gifts when ordered before the cutoff time. The cutoff time for Easter Bunny Chocolate Basket is in the recipient's time zone. Old Fashioned Lemon DropsTastes just like the ones from your childhood candy shoppe! Hard candy lemon drops are all natural and made with real lemon juice. Lindt Hazelnut Chocolate CarrotsLindt's Chocolate Carrots are made using Lindt's rich milk chocolate and a decadent hazelnut paste. Each 'carrot' is individually wrapped! My son, daughter in-law and grandchildren all loved their Easter basket. A welcome range of chocolate for every taste. This is great, I love the bunny.